Lions, Warriors & Poetry—OH MY! I received this in my inbox today (via Poets.org) and promptly made me pee my pants. Did you know that you can sign up to get a poem a day in your e-mail? Well. Let me tell you—somedays it hits me just right. Shiiiiittttt. Still toiling with the Poem-a-Day November Challenge via Writer’s Digest, headed up by Mr. Robert Lee Brewer and his blog. I’ll finally share one with ye peeps. Makes me nervous—sharing in such an open forum—but mostly it makes me laugh. Can one get more dramatic than an Instagram-ed photo of a poem? I believe Shakespeare would find this hilarious, himself. Thanks to Instagram for this one. 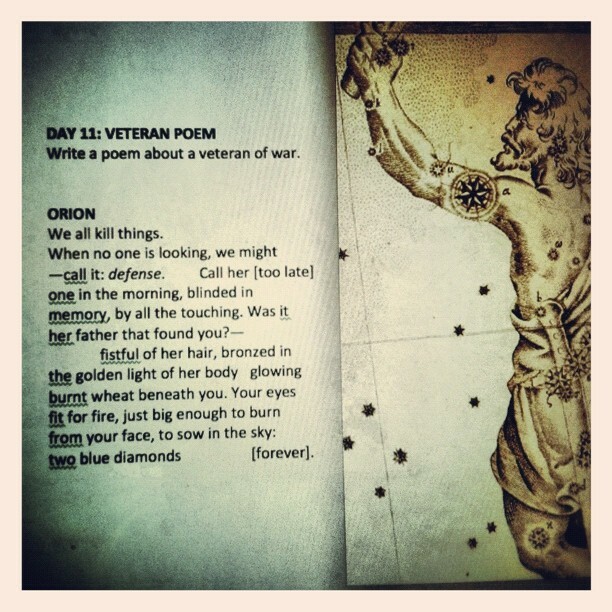 I think it’s great, also, that I can find a way to turn a “veteran poem” into something celestial. Always. 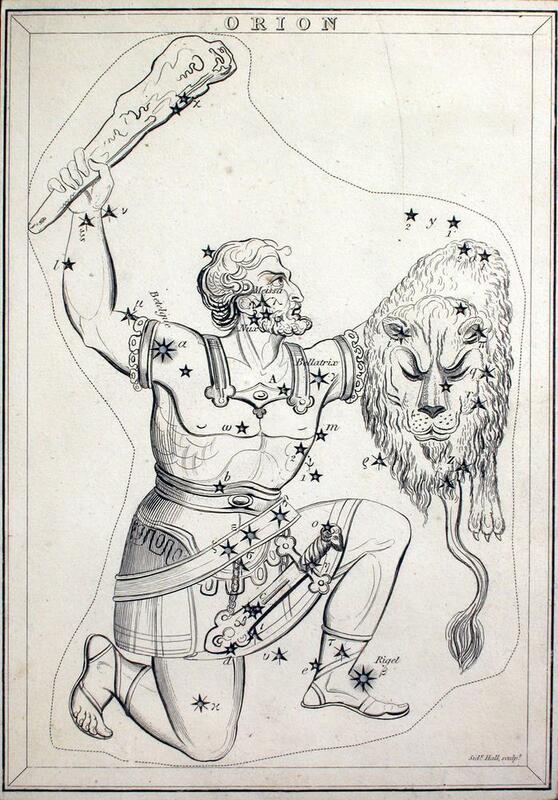 And Orion seems to make many appearances in my work. In my pics I found online, he’s killing a lion. Coincidence? It just so happens I’m a Leo. RAWR! Are you into mythology? Personally, I never got into it as a young one; in fact, I believe it was my 12th-grade English teach who had to jam mythology down my throat. Well, then, I just coughed it back up. Ick. She was waaayyyy into it, too. Sorry, Ms. Schank. I didn’t understand before. Now, as it relates to the sky, I love it. I love making a connection between myth/sky/underlying meaning. Hm. Big metaphor, yo. It’s a beautiful thing. On that note, time to go finish up a few things and lunch. In my car. Grading papers, I’m sure. Yay!